Can’t afford the Porsche of your dreams? Well, with a bit of creative thinking, perhaps you can. How? By buying a damaged-repaired car – what is classified in the UK as a Cat C or D vehicle. Typically, such a car is worth as much as 35 percent less than list, once repaired. The other side of the argument, though, is that such write-offs should be avoided at all costs. As is often the case, though, there’s a lot of misinformation going around about written-off Porsches, so let’s put the record straight. Put simply, such a car has been damaged in some way, and the insurance company has deemed it uneconomical to repair (typically if the costs exceed 60 to 70 percent of the vehicle’s value) and paid the unfortunate owner the market value of the vehicle. The car then becomes the property of the insurance company which, typically, sells it to a salvage company that, in turn, either repairs it or sells it on to a garage or individual who will repair it themselves; either to keep or, more often, to sell on at a profit, but still for less than an equivalent unmolested car. How, though, if the insurance company’s assessor has written the car off as uneconomical to repair, can someone then return it to roadworthiness and make some money to boot? Well, the insurance company would calculate the cost of repair using brand-new parts and factor in labour rates, and possibly the cost of a courtesy car for use by the owner while repairs are being made. However, by using second-hand parts and doing the work themselves, it’s possible for a repairer to keep the costs right down. On the flip side, though, another way of saving money is by skimping on the quality of repair – which is why you need to tread carefully when buying a ‘write-off’. If you’re considering buying a damaged-repaired car you need to go in with your eyes wide open; but of course you should do that with any car purchase. Honest sellers will make it clear that a car has been registered as Cat C or D (see xxxxx for an explanation of categories) and will price it accordingly. However, the less scrupulous may try to fob off such a car as ‘straight’, so it’s essential to check the paperwork with the vehicle and run a car check (see xxxx) to discover its history. If a car has been listed as Cat C, then tread particularly carefully, as that rating suggests that it has suffered serious damage, while Cat D generally means that the damage has been less severe. That said, we have heard of insurance companies factoring in the cost of a hire car into the equation, which can push a Cat D car into Cat C! The interesting thing about all this is that a newish, high value 911 can suffer quite severe damage and be deemed worth repairing, so you can unwittingly buy such a car at market price and, assuming the work has been carried out properly, never be aware of the car’s history. Internet forums are full of stories of high-value Porsches, such as GT3s, being badly damaged, repaired and – rightly or wrongly – sold on at full price. Yet similar damage to an older, less valuable car will lead to it being written-off and, even if it’s been properly repaired, it will forever be known as a Cat C or D and be valued accordingly. Another factor that can lead to this outcome is the fact that many classic Porsches can be more expensive to repair than modern ones; for example, a 993 front wing is about £800; more than twice the price of the equivalent 996 item. Interestingly, as values of classic Porsches have gone up, a car that would have written off, say, ten years ago, would today be considered worth repairing! All of which is why such a Porsche can be a great buy. As a guide, a Cat C should be priced 30-35 percent down, and a Cat D car 20-25 percent lower than expected. 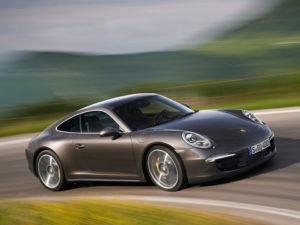 As with a non-damaged Porsche, though, the value will also depend on mileage, condition and service history. Buy carefully, then, and you’ll end up with a Porsche that looks as if it’s worth more than you paid for it, and no one but you will be any the wiser. Plenty of people do it and are very happy with their cars.